A new book drastically refigures our understanding of Hollywood’s interaction with Nazi Germany during World War II. Contrary to popular belief, World War II-era Hollywood was no bastion of anti-fascist propaganda. Movies produced during Hollywood’s Golden Age, which ran from 1927 to 1963, were extremely popular in Nazi Germany—and the success was no coincidence. In The Collaboration: Hollywood’s Pact with Hitler, Harvard fellow Ben Urwand explores the secret dealings between the German government and Hollywood brass that occurred before and during the war. MGM head Louis B. Mayer, arguably the most powerful man in Hollywood at the time, is said to have negotiated export of new movies with the German consul in Los Angeles and edited out parts that did not please the Nazi sensibility. Until the outbreak of World War II, between twenty and sixty new American titles hit German theaters every year; Hitler himself was a huge fan of Merian C. Cooper’s 1933 film King Kong. Urwand’s investigation of this dark chapter in the history of the American film industry is as intriguing as it is compellingly told. Hitler loved Mickey Mouse. Propaganda minister Joseph Goebbels once presented the dictator with “12 Mickey Mouse films,” which according to Goebbels made Hitler “very pleased and extremely happy.” Hitler was probably less pleased with Disney’s 1943 foray into anti-fascist propaganda, the animated short film Der Fuehrer’s Face starring Donald Duck. 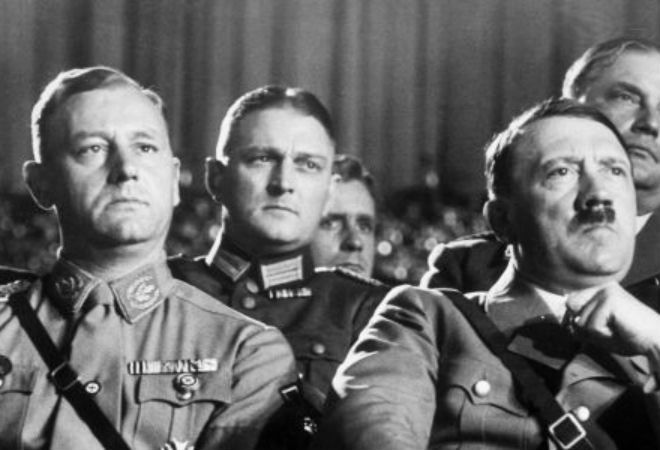 Every night before bedtime, Hitler screened a movie in his private cinema at the Reich Chancellery. All members of his household, staff and guests alike, were invited. Hitler’s adjutants would jot down his impressions afterwards. “Bad,” was the taciturn response to Tarzan, surprising considering the Nazi idealization of beautiful, muscular male bodies. Greta Garbo was one of Hitler’s favorite actresses. In his diary, Joseph Goebbels wrote of Hitler’s response to Garbo’s performance in Camille, a 1936 movie about a young woman with a troubled past finding love: “The Führer is glowing!” There’s an image for you.